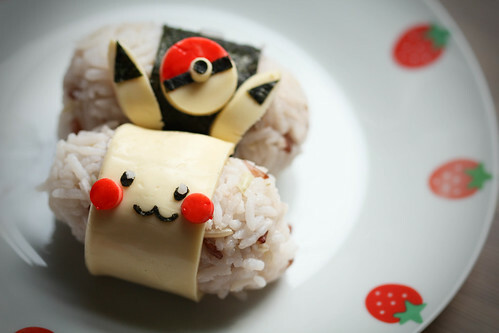 This is a tutorial for the Pikachu bento I posted on Monday. 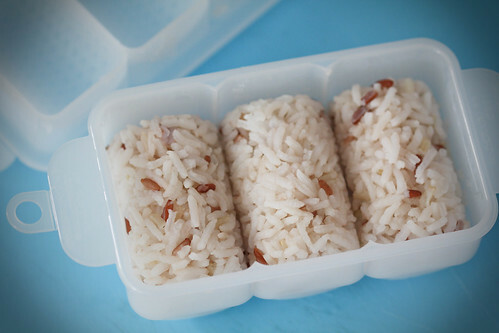 Please note that I'm using mixed grain rice and cheese in this tutorial, instead of sushi rice and egg sheet. 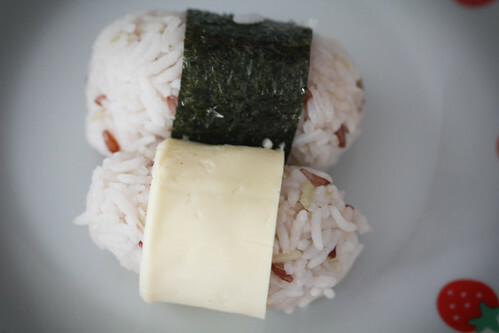 If you are doing it, I suggest you try with sushi rice instead, and make the onigiri smaller as cheese is thicker than egg sheet. First, shape your rice. 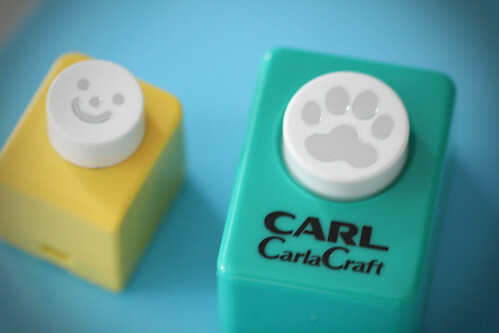 You can use a rice mold if you have one. 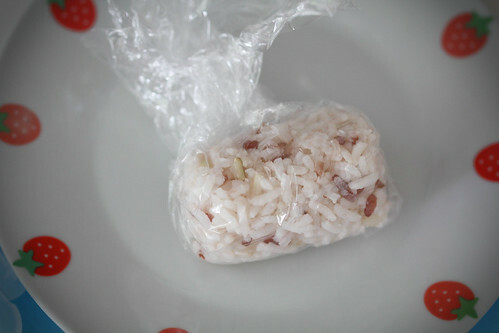 If you do not have a rice mold, you can use a cling wrap to shape the rice. 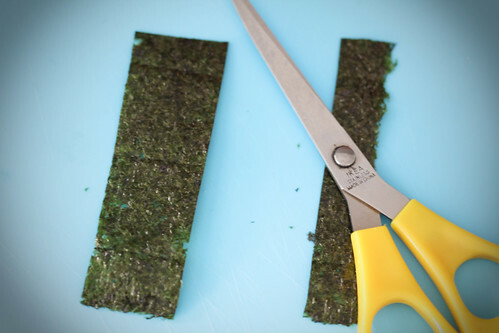 Cut out a slice of seaweed to wrap round the rice. 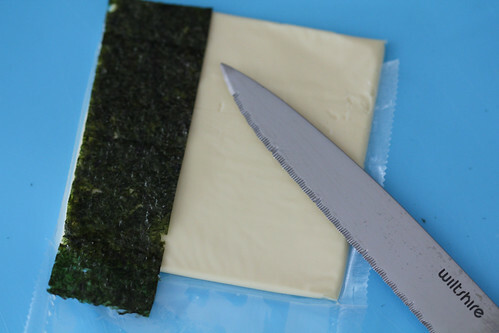 Use the seaweed as a guide to cut out a slice of cheese. 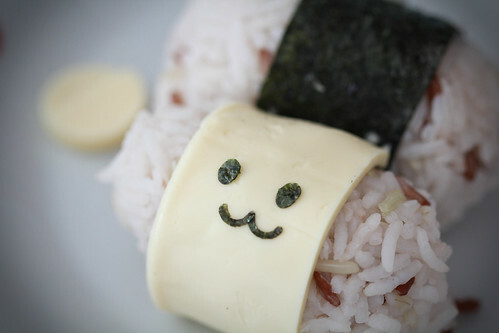 Wrap them around your onigiris. Punch out 2 circles for Pikachu's cheeks. You can also use a straw to do this. 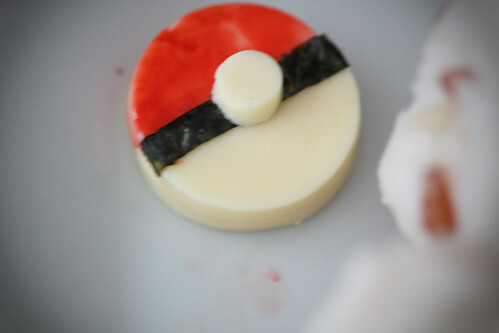 Then, cut out 2 circles with a round cutter, this is for the pokemon ball. You'll understand in a while why I skipped to this step. Cut off abt 1/3 of the circle. 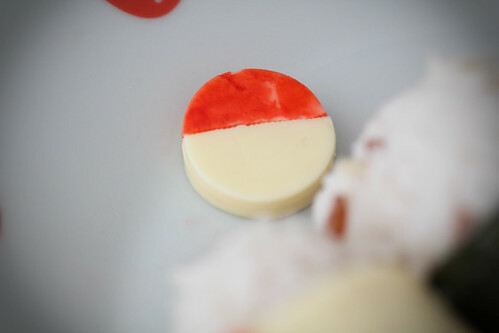 And that's why I am doing the pokemon ball first, so they can be colored with Pikachu's cheeks. 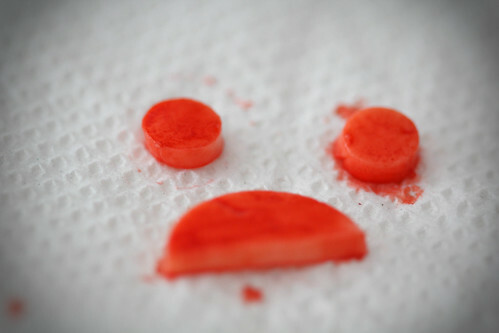 I use Wilton color mist for this, you can also rub on some red coloring. Then leave them in the fridge while you move on to the next step. I'm using the yellow puncher to get pikachu's mouth, and the green puncher to get his eyes. 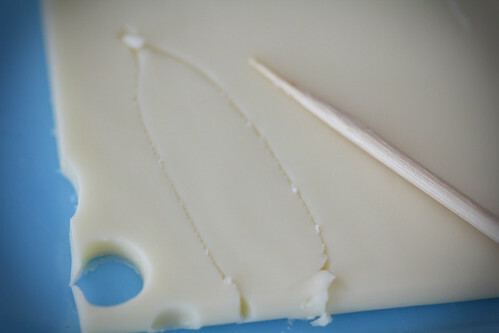 Punch out the nori and add them on the cheese. 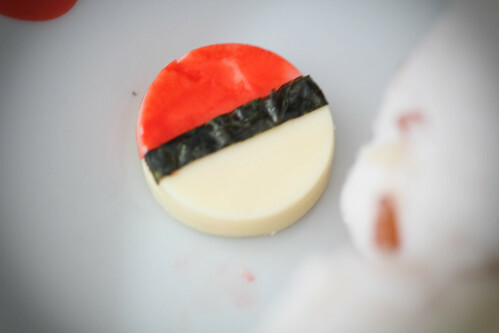 Assemble back the pokemon ball. Cut out a strip of nori and add on the ball. Using a straw, cut out a small circle for the pokemon ball. Sorry, I forgot to take a pic for the next step. 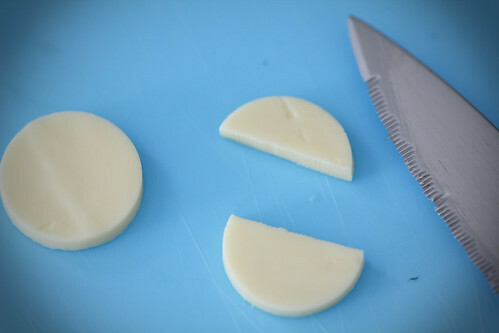 You have to punch out a small circle from nori and add on the cheese circle. 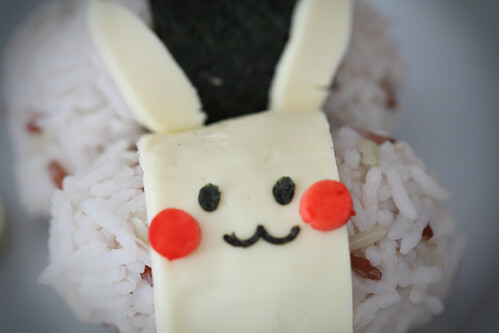 Cut out pikachu's ears using a toothpick. 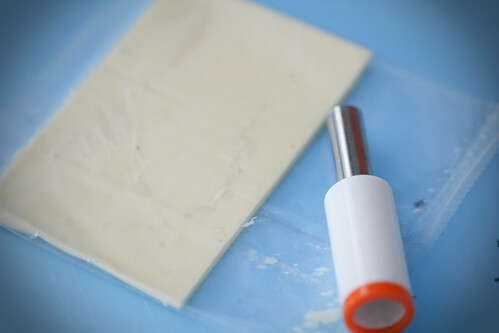 If you are using egg sheets, you can fold the egg sheet in half and use a scissor to cut it out instead.